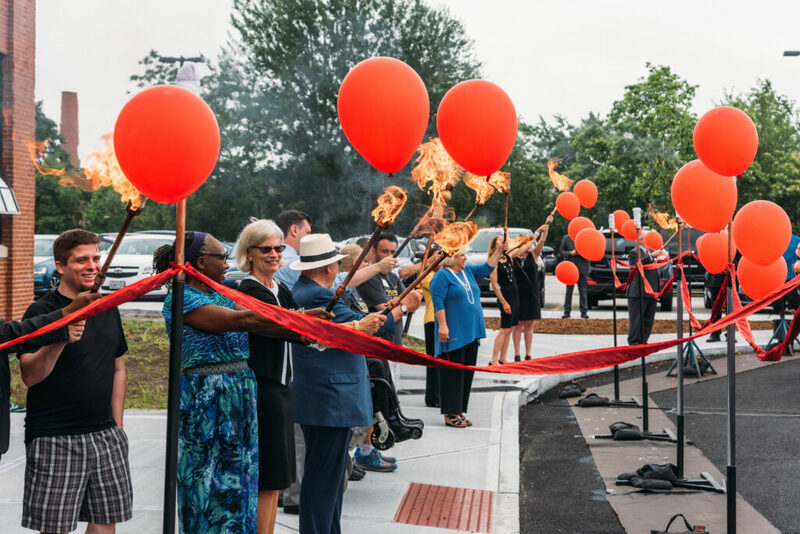 Thank you to all who attended the official grand opening and Ribbon Burning ceremony at the WaterFire Arts Center. We were honored to kick things off with a wonderful rendition of Summertime by the inimitable Rose Weaver. A big thank as well to all of the community leaders that joined us to share their thoughts on WaterFire Providence, the ability of the arts to inspire a community, and the exciting opportunities that the revitalization of the Valley/Olneyville neighborhoods presents to our neighbors and Rhode Island as a whole. Speakers at the ceremony included: Leslie Gardner, WaterFire Providence Board President; Senator Jack Reed; Senator Sheldon Whitehouse; Congressman Jim Langevin; Providence Mayor Jorge Elorza; Acting City Council President Sabina Matos, Jeanne Cola, Executive Director, LISC (Local Initiative Support Corporation), Maria Barry, National Community Development Banking Executive, Bank of America Merrill Lynch; and Randall Rosenbaum, Executive Director, RISCA (Rhode Island State Council on the Arts). The WaterFire Arts Center is now officially open for business, you can visit us at 475 Valley Street, Providence RI 02908. The WaterFire Store in partnership with Symposium Books is open 5 days a week and features a broad selection of art books, WaterFire apparel, and other gifts by local artisans including Gather Glass Studio. We are also pleased to be opening a new learning lab powered by Arnel Milhouse’s team at IntraCity Geeks, you can find more info about class offerings and registration forms on their website. WaterFire Arts Center Ribbon Burning Ceremony. Photograph by Eric Dush. The WaterFire Arts Center project was a massive team effort. Thank you to all of our partners that helped to bring the project to fruition: Barbara Sokoloff Associates – Barbara Sokoloff, Derek Farias; Brian Kortz, Senior Project Manager, Fuss & O’Neill; RI DEM; Jessica Dominguez, Project Officer, US EPA; Clark Schoettle, Executive Director, Providence Revolving Fund; DBVW – Doug Brown and Ashley Prester; David Odeh, Principal Engineer, Odeh Engineering; Brian Kelleher, Project Manager, The Aspen Group; TRAC Builders: Bill Tracey, Nelson Ferreria and Todd Brodeur; ALCO/Foundry – Tommy Guerra, Tony Thomas and Dan Nichols; Bank of America – Mary Thompson and Bill Hatfield; LISC – Carrie Zaslow, Mary Fasano and Robert Poznanski; Klein Hornig LLP – Rita Schwantz and Dan Kolodner; Nonprofit Finance Fund – Shawn Luther and Claude Rosen; The Legal Offices of Ronald C. Markoff – Ron Markoff and Marc Gertsacov; Burns & Levinson LLP – Sean Coffey; Mary Gagnon, WaterFire Providence CFO. The following foundations helped to make the WaterFire Arts Center project a reality: 1772 Foundation, Amica Companies Foundation, Bafflin Foundation, Champlin Foundations, Cowles Charitable Trust, Felicia Fund, Hassenfeld Family Foundation, and the Ocean State Charities Trust.